“Do you want to go to a metal show? I have an extra ticket” my friend Joe Cruz asked. It was February 2017, years since my last metal show, a genre that had influenced my life since middle school. I said yes. What’s memorable about the show wasn’t the band itself – it took me 15 minutes to reverse engineer who I saw and when – but the necessary pre-show beers that were consumed and plans that were hatched. “Do you want to go to a metal show? I have an extra ticket” my friend Joe Cruz asked. Our series of Japan Bikepacking posts was supported by our friends at Garneau who are also one of the primary supporters of the TBD journal. Joe has done it all over the last three decades. From a six-month ride from the north of South America to the south to Tibet to Nepal to Egypt to Syria to Kyrgyzstan. If you’ve never seen it, check out his spectacular bike packing blog to get an idea of types of the trips he takes. I can be very particular about who ride with and the list is relatively small outside of my team, To Be Determined, and Joe sits on the top of that list. Given the staggering number of places he’s been, I thought it would be difficult for me to come up with a place that I wanted to visit by bike and that he’s never been to. It was very simple. I blurted out “Japan?” after a total of 30 seconds of thought. “Never been, it’s on the top of my list, let’s do it” he replied. The next day we had agreed to an outline, and I had an email off to our mutual friend Shuntaro Takeuchi a Tokyo native and old riding buddy of ours. Japan has had a large impact on my life. From Nintendo to my first Walkman (and then Discman) to my family’s two cars growing up, we have been mass consumers of Japanese entertainment, innovation, and goods for decades. Even some of my favorite shows on Nickelodeon as a child in the 1980s and early 90s were Japanese shows dubbed into English. This ever-present interest led me to study Japanese while attending university, ultimately exposing me to the language, medieval and modern Japanese literature and poetry, and her fascinating history. One of Japan’s rich literary traditions is the haibun or the marriage of poetry and prose most often taking the form of a travel journal. One of the most famous works of haibun is Matsuo Bashō’s Oku no Hosomichi, which chronicles the haiku master’s arduous journey late in life to the north of the Japan. It’s partially with Bashō in mind, why seeing Japan using the power of my two legs accompanied by close friends was so appealing. The easy part is picking the destination. The hard part is everything else. I offered a spot in our small party to my friend Bryan Banducci who is always down for an adventure, and he came back with an unequivocal yes about as fast as it took me to send the inquiry. He invited his friend Parker Feierbach, also a photographer, and our little band of four was set. Joe undertook the route, a painstaking kilometer by kilometer review of the least grueling path from Tokyo to a yet-to-be-determined destination. He regularly reached out for input – do we end in Fukuoka, Hiroshima, or somewhere else? Do we ride out of Tokyo or take an early morning train to Mt. Fuji and start from there? Do we spend a day resting and playing tourist in Kyoto and lose a day in Tokyo? Do we skip Osaka in order to do a more fun variation of the route? Which days do we camp and which days do we look for traditional onsens (hot spring inns) or ryokans (traditional Japanese inns) to stay in? Are multiple 80-100 mile days with insane amounts of climbing back to back to back too much? The result was a 900-mile route from Mt. Fuji to Hiroshima via a day in Kyoto including several ferry rides to cut down on mileage, and as many dirt and gravel forest roads we could handle across the islands of Honshu and Shikoku. The answer to our last question was yes. We ended up setting an average daily workload of 60 miles with around 6,000 feet of climbing spread across 14 days (13 riding days and one day of rest) six of which would be indoors with the remaining eight being under the stars. It’s important to note that roughly 80% of Japan consists of mountainous terrain so finding a day with no fewer than one to two mountain summits is near impossible. In short, this route is nothing to sneeze at on fully loaded touring bikes. All of this gear went into their respective bike bags, and then into my Pika Packworks soft bike bag along with my disassembled bike. Everything was tucked in together for the 20 hour journey to Tokyo’s Haneda Airport via Beijing. Tokyo is very big and very quiet. Imagine if you took New York, doubled the square mileage, added five million to the population all while making it cleaner and taking away the noise pollution. That’s Tokyo. I’m oversimplifying, but it was interesting to see how much of a contrast it struck to New York. The trip to Haneda was long, but uneventful, and our first evening was filled with a surreal waking tired feeling, which followed us through the bike assembly process and search for our first meal in Japan. Luckily, aside from Parker who had a seemingly few minor issues with their drivetrain and front wheel, both tasks went off without a hitch. Bed was early as Joe and I theoretically hadn’t slept in 36 hours. My eyes opened to soft street noise and light coming through the window of the second tatami mat bedroom in the Airbnb we were renting in Shibuya. Our alarms were set for 5:30 and hadn’t gone off. Why? Surely it must be past 5:30. It wasn’t. I learned that the sun rises around 4:30 am. The soft light indicated it was actually 4am. I’m a light sleeper so between the light and the jet lag, I was up whether I liked it or not. This became a recurring theme for me during the trip. Shuntaro happened to be in Tokyo for work, and agreed to give us a personal bike tour of the city hitting many of the “must see” sites. The weather was beautiful, and it felt good to stretch the legs and make sure the bikes actually worked - I was very pleased mine did not collapse into a pile of parts after the 7,000 mile journey from New York. 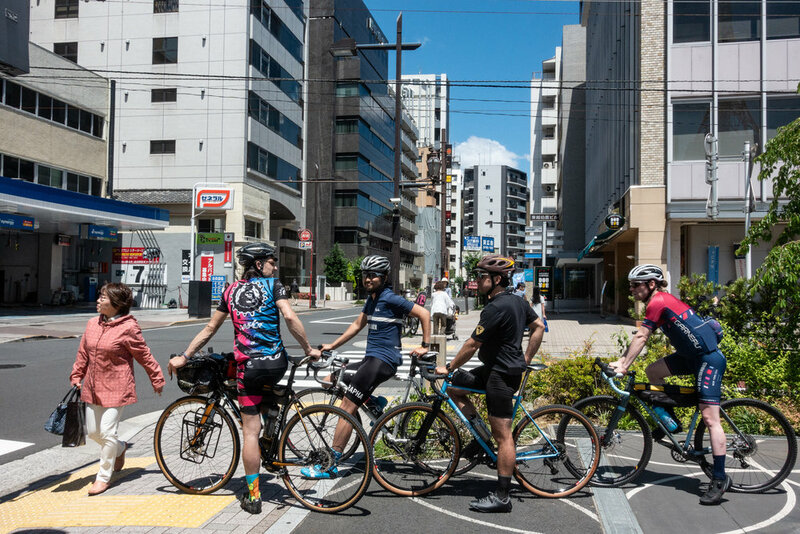 We pedaled around the city, passing through busy, but quiet streets while being ushered through crossings and construction zones by uniformed, white gloved Japanese men. Shibuya crossing, Tokyo Imperial Palace, National Diet (that’s dee-et) Building, were among the locations we were able to take in in rapid succession. However, the real highlight was an amazing bakery called No. 4 located in the politically important Chiyoda neighborhood. It stood a stark contrast to political operatives in dark suits. Children played around tables outside while the friendly staff served freshly baked bread, pastries, and western breakfast plates such as avocado toast to the overflowing patronage. This was the second of two good meals we had in our mere 24 stay in Japan. We were eager for more. Now we legitimately had a 4:30 wake up if we were going to make the first commuter train to Fujisan Station. Fujisan, which is how the Japanese refer to Mt. Fuji, is located on the main island of Honshu, and stands as the tallest mountain in Japan and 7th-highest peak of an island in the world. It’s the most famous of the Three Holy Mountains and is a UNESCO World Heritage Site. Based on these facts, Fujisan made the perfect starting point for our 900 mile journey. Into the station the train pulled. The whistle blew, and only a few disembarked including our small party struggling with rinko bagged bikes. With bikes re-assembled for what seemed like the tenth time in two days, we rolled to another 7-Eleven for more supplies - canned Suntory Boss coffee, the newly discovered packaged pancakes complete with maple syrup and butter filling, custard buns, onigiri, Pocari Sweat, and Snickers. We passed on the hot dog buns filled with noodles. Once fed and re-caffeinated, we proceeded out of the parking lot and began climbing. First we climbed on leafy tree lined streets with standard town car traffic, then we climbed onto a more thinly canopied access road, then the access road narrowed and the cars slowly disappeared. We climbed through tree cover, to more barren landscapes, to a gate. We climbed over the gate despite the warnings of hikers. The only path was up. We continued on for what seemed like an eternity until we hit the end of the developed road and proceeded on to an unpaved construction road covered with dirt and volcanic ash. Up the road we went. The trees were gone now, unbelievable vistas exposed. We could see small towns dotting the valley and thick forest below. It was something out of a dream as the sky was clear and the air perfect. Three hours we climbed from the 7-Eleven to the vehicle summit of Fujisan. It was around 4,500 feet in total over a pleasant sloping gradient, and other than a steeper pitch about two miles from the summit, it was one of the most lovely climbs I’d ever done. We had taken one of the roads less traveled up to the visitor’s center as there is a main paved road with heavy bus and car traffic that most cyclists typically take. We planned this trip with the unordinary in mind, and this was a practical first step. It was now afternoon, and over 60 more miles of pedaling lay before us. We quickly crushed our newest discovery, Peach Coke, and headed back down the way we came. It was now a race against daylight, which we promptly lost. Nearly seven hours, and one episode of getting lost in the woods later, we came upon our first camp location in the city of Minami-Alps, aptly named and nestled in the foothills of the Southern Alps. I don’t remember the name of the restaurant where we spent hours getting drunk off Asahi and Shōchū with our new found friends at the table next to us kept pouring, but I do remember riding to Midaiminami Park where we pitched camp around midnight in a remote corner hoping for a peaceful night without being asked to leave. I was awoken by what I would define as the Morning Dove, or lawn mower bird of Japan. The sound was grating. Wherever we camped, this bird was there. following us like a specter making sure we were always up by 5 am so we could start the day’s journey. Once awake, I was surprised to see that the local Midaiminami Park exercise enthusiasts cared not that we had set up tents in their park. Joggers, hikers, and dog walkers passed by with a smile and a friendly greeting of “Ohayou Gozaimasu!” We were told before and even during the trip that wild camping and park camping wasn’t a thing in Japan, but these people seemed to disagree. Maybe there was hope yet for peaceful nights under the stars. Day 2 held for us some beautiful gravel climbs through the Southern Alps. Unfortunately to start these climbs we had to ride on a narrow shouldered highway where traffic was ever present. The reward though was a climb even more beautiful than that of Fujisan. The forest was thick as if untouched by civilization and the sounds of nature everywhere. We were greeted about a half mile up by a shimmering waterfall with a large Japanese sign, which I could only imagine said “Welcome! You will enjoy a beautiful hour long climb after this point!” What goes up must come down and we white knuckled the gravel bomb down the other side coming to rest in front of a Swiss themed Southern Alps visitor’s center and restaurant. It is here where we met one of the most memorable people of our trip. Her name was Humi, a young woman of about college age who worked the counter of the restaurant. She took an immediate fascination to us, four westerners riding camping gear-laden bikes through her tiny corner of the universe. She went to great lengths to make sure we understood what was on the menu. What she couldn’t say in English, she drew on a pad of paper. Mushrooms, beef, chicken, she so skillfully drew these items that we immediately understood - art as a universal communication tool. While we waited for our food, Humi told us that she grew up in Kobe, but moved out of the city and into this small mountain town so she could see the stars. She made a good choice as the sky in the Southern Alps shone beautifully. With our bellies full, packs resupplied, and a bit tipsy from yet more Asahi beer, we prepared to set off. Saying sayonara to someone like Humi was difficult. She was genuinely sad to see us leave, and even jumped up and down and squealed when Bryan said we’d be back. Her final act was running after us to give me my phone, which I had left on the table. I write about Humi as she is one of those people you meet that you will never forget. Joe, Bryan, Parker, and I were made better by meeting her. Onwards we went up more climbs and down beautiful European style switchback descents. Afternoon turned to dusk and dusk to night. We pulled the plug around seven miles from Wakahara Falls where we planned to camp as the road became nearly too dark to ride, and the air too damp and cold. We picked a patch of gravel and grass next to the road, pitched camp, and made a fire to warm our wet and shivering bodies. The moon shone bright on the side of the mountain as we spoke of Humi, the amazing climbs and descents, and what lay ahead.